We had a chance to chat with Les Barr, a farmer from the Digby area, on his upcoming projects. A homebrewer for many years, he is opening Roof Hound Brewing this summer. Brewing is just one side of his creative outlets, as he is an accomplished home cook as well. Anyone following his Instagram feed can attest to that! His passion for preparing meals has led him to the biggest stage for amateur chefs in Canada, MasterChef. With the third season kicking off this weekend, we caught up with Les to talk about his background with cooking and brewing, his experience on the show, and details of Roof Hound Brewing. ACBB: I know you can’t give too much away about MasterChef, but what was the experience like? the only one chosen from NS. This was both very flattering and a lot of pressure knowing I was representing my entire province. Other than that, I can say that it was fast, furious and intense. It’s a lot of pressure. Long, exhausting days on set competing for the MasterChef Canada title and $100K with the best home cooks in the country. It’s very intense, but you either rise up to meet the challenge or buckle under the pressure. It challenges you, and I know I’ve come out on the other side a better cook and stronger person. Anything that really surprised you? The most surprising thing was being the only one chosen from NS. I really thought they must have made some sort of mistake. Haha. There were 8 from Atlantic Canada on Season 2 and only two of us in Season 3. What were the other contestants like? The other 39 people were great. It was such a rush to be with such talented and interesting people who have the same passions and interests. I think we all learned from each other, and many of us will be friends for many years to come. Do you have any allergies, or were there any ingredients you were nervous to work with? Yes! I’m from Digby, the home of some of the greatest shellfish on earth, and I’m allergic to shellfish. Rubber gloves and allergy meds are your best friends in that situation. I don’t usually cook with shellfish for this reason, so I practiced that a lot before going to MasterChef Canada. Having seen the show before, were there any challenges you were nervous or were hoping they’d repeat? Do you like cooking and baking equally? I really do. Most of my creations have some sort of flour like pizza, burgers and crusts. Maybe it’s the brewer in me, but I love grains and yeast. To me, I don’t really draw a line between cooking and baking. You sometimes use beer as an ingredient. What do you feel it gives to a recipe? The most common use of beer in my kitchen is for dough. I find that it gives you a long ferment taste in things like pizza dough and bread in a very short short time. You can use half beer and half water to make pizza dough in an hour and it tastes like it’s been fermented much longer. Do you have an all-time favourite recipe you always come back to? Speaking of your children, are they interested in cooking as well? Oh, yes! Our 10-year-old son, especially. He has been sitting on the counter stirring lemon curd for cheesecakes and things like that since he was three. Our oldest daughter is 13, and she loves baking. She totally is the one in the family with the sweet tooth. My wife and I encourage them to cook and learn as long as they are safe and clean the mess. Haha. That’s how I grew up. What is their favourite dish you make? Cinnamon rolls in a skillet for weekend brunch, but they also really like my pulled pork shepherd’s pie. Kind of a southern twist on a European classic. Do you have an all-time favourite beer recipe you make over and over again? I have three that I make regularly with very few changes: Big Brown Roof Hound, a 7% brown ale with raisins, brown sugar, oats and vanilla bean; Little Pup Pale Ale, your basic intro pale ale; and Big Dog IPA, which is finished in the eyes of some of my friends, but I’m still holding out hope in developing a more juicy character with my hopping techniques. Turning to your brewery plans: Is there something specific that got you into the world of beer? I had left a career after 10 years, and I really needed a hobby to focus on. My dad makes wine and was loving that hobby, so he got me my first beer kit. I did two partial mash kits and then jumped straight into all-grain. Most equipment is already in here. Business is registered. Media in place. The financing is in place. Location is set. Just finishing up the license applications, and then construction is all that is left, really. Where did the name “Roof Hound” originate? Many years ago, there was a man with many children. Eleven, in fact. He had so many children that he had very little money to spare for recreational drink. So, this man decided to make his own. He put water, raisins, brown sugar and yeast in a bucket, and placed that bucket behind the wood stove where it fermented and turned to alcohol. The man enjoyed his liquid creation, and poured the swollen raisins out in the backyard, where the family hound dog found them. The hound ate those alcohol-plumped raisins, climbed up the woodpile, and onto the roof of the house. There in its drunkenness, the hound moaned and howled throughout the night. The man’s many children found this very entertaining, and henceforth the story became part of the family folklore. Today, the grandson of that man keeps this story alive with Roof Hound Brewing Co. and Big Brown Roof Hound Ale made with raisins and brown sugar. This is the story of the Roof Hound. I’ll be brewing double batches on a three vessel system built out of a stainless steel scollop bin and two 500 litre wine tanks. All electric. Where will your brewery be located? Roof Hound Brewing Co. will be in its own building only 4 minutes from exit 26 off highway 101 near Digby. The brewery will be built on an old farm property overlooking Acacia Valley. We are constructing the building out of shipping containers. Once the brewery and restaurant are established, we plan to surround the property with a hop yard. We are aiming for June 2016. The plan is to try to sell the majority of our beer by the pint in our restaurant and in growlers at the brewery and local farmers’ markets. We will concentrate our keg sales in the SouthWest Nova region, but we also hope to be on tap at a couple of the beer bars in HRM. No plans to bottle or can yet. Yes, I’ve had some interest already, but we haven’t really pursued keg sales very much. I’ve spoken with some of our NS craft beer friends who say they kinda over committed on the kegs, and then had a hard time supplying themselves for growler sales. Can you tell me about the beer(s) you plan on offering initially? Any seasonals, one-offs, or will you stick mainly with a “flagship lineup”? Mostly English-inspired. The three mentioned above, and another regular beer in development called Roof Top Rye-It. It’s an amber-coloured, dry hopped ale with a hint of rye spice. One of the benefits of a small brew system is it gives you more freedom to experiment. There will be many seasonal and experimental one off brews as well as sodas. 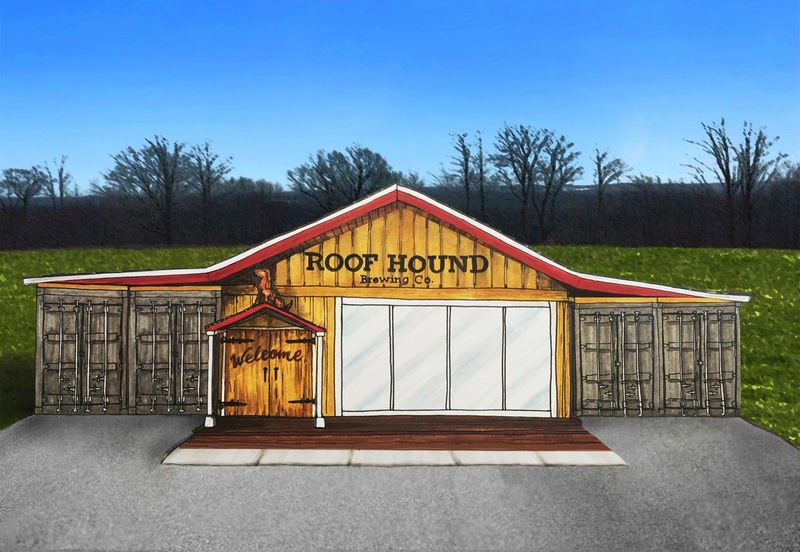 Roof Hound will open with eight taps. For how long have you been homebrewing? I’ve been brewing for five years, but I have spent hundreds of hours listening to podcasts and audio books on brewing while working on the farm. That’s helped a lot. Well, it’s a common homebrewer’s dream, but I got very serious about it when the farming industry kinda took a downturn. That made me take the brewery dream more seriously, and then with the attention of MasterChef Canada, I knew it was now or never. I love grains like oats, wheat and rye. I find that they give you a mouth-feel and body that you just can’t get out of barley alone. The Brewing Network has been the single biggest influence in my brewing. Being way down here in Digby, there aren’t many other all-grain brewers around, so it was kind of a long, hard, self-educating process. After that, I’d say the Brewnosers have been a huge help. A few guys like Jeff Saunders, Greg Nash, Chris McDonald, and Jimmy Beaman have been very encouraging. Ed Barkhouse from Noble Grape. Mike Ferguson from Rudder’s. It’s an intimidating thing to get into with all the science and math, but I’ve had cool people help me get through. Thanks! Thanks very much to Les for taking the time to answer our questions. Follow along on Les’ journey to MasterChef Canada glory starting this Sunday, Feb 14, on CTV. His Instagram feed alone will keep you cheering him on! Check out Roof Hound’s website and Facebook page to keep abreast of the brewery and restaurant progress in Digby. Go Les! ← Friday Wrap-Up – News from Mama’s Pub, Flying Boats, Breton Brewing, YellowBelly, Petit-Sault, Acadie-Broue, and much more!